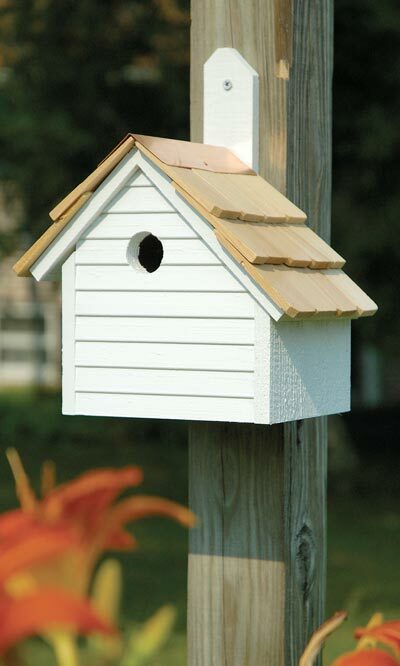 Bring a classic feel to your bird sanctuary with the Heartwood Cape Cod Wren House. This home has a central entrance hole, to mimic the center door on standard Cape Cod homes. The attached hanging tab evokes the look of a chimney, and horizontal beadboard on the front completes the theme. The 1.25" diameter entrance hole is perfect for wrens and chickadees, and the shingled roof protects the home from the elements. Drainage holes in the base keep the nest dry, while a copper cleanout panel at the back of the house allows for frequent maintenance. A copper ridge cap at the top of the roof adds even more interest, and the whitewashed finish lends a timeless feel to the item. Use the attached hanging tab to mount this item to a wall or post, and watch its beauty enhance as the durable cypress construction weathers over the years. Offer a classic roost for your birds with this Cape Cod Wren House. Made in the USA. Achla Post Mounted Squirrel Baffle, Black, 18" dia.